Your Coton de Tulear, being white, will probably find himself getting into some dirty messes now and then. 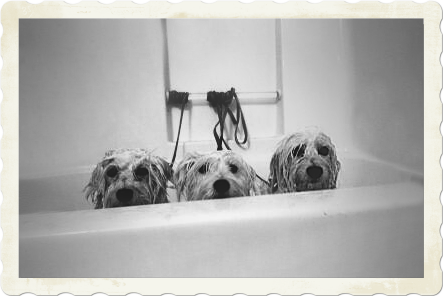 If they didn't, unlike regular dogs that get stinky from the oils in their skin, they'd never need a bath at all! No need to buy shampoos that add shine to hair; your Cotons hair isn't supposed to have shine, his hair should be dry, soft, and not shiny. The lack of those extra oils in their hair and skin are what gives them their unique hypo-allergenic quality, and hair that feels like natural cotton, just plucked! 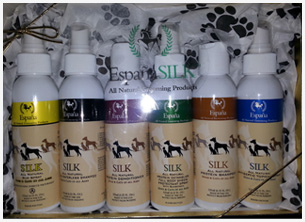 My favorite line of dog grooming products is EspanaSILK. It's a MN company I learned about through their horse products. I love how they all smell, the natural ingredients, and how effective they are. I can use a lot less product to get better results. Espana Silk Protein Shampoo is my usual choice, (and I love their detangler) but I sometimes choose whitening shampoos, or medicated shampoos.. even their dry shampoo. Admittedly, to buy all the Espana products at once can be pricey, so I've collected them over time. I find that once I get them, they last a really long time (and I bathe a lot of pooches!). I use condiment bottles, and dilute shampoo at about 1:8 ratio with water. I cut the tip just a bit so it's slightly larger than how it arrives. I squirt the dilute mixture onto the dog, and it just melts into the coat beautifully. I gently massage, rinse. Then the same with the conditioner, and rinse. Whatever shampoo and conditioner you choose, make sure it's gentle, preferably mostly natural ingredients, and make sure if it's scented, it's a scent you like and both you and your dog aren't allergic to. You can do a small spot test on both of you, just dab a bit on and leave it there 10-15 minutes. If there's no redness, it should be fine. Some people like to make sure they have a tear-free type shampoo around, in case they have to wash their dogs face, near the eyes. 1) Rinse to wet hair thoroughly. Apply (diluted 1:8 w/ water) whitening shampoo on entire dog. Make sure to get it worked into paw hair that may be extra stained. You can use a toothbrush to carefully get the under eye area, but don't get anything in their eyes. Let sit on dog for 5-10 minutes. 3) Apply regular dog shampoo, lather and rinse thoroughly. 4) Apply (diluted 1:8) conditioner. Allow to sit a few minutes on hair. Blot your dog dry, don't scrub with the towel (that causes snarling). Never try to comb out your dog when they're wet, it will stretch, damage and break their hair. Combing out should be done before the bath. I usually spritz them with Espana detangler/coat conditioner and use my fingers to gently get it into the coat before blow drying. It conditions the coat, detangles it, provides UV protection and SMELLS GREAT. If you get a fair quality high velocity dog dryer, their hair will dry much faster and make things less tedious all around. This is also very helpful for drying them quickly in the winter, when they can collect huge amounts of snowballs, or on rainy days. Initially, they act somewhat frightened about blow dryers, mostly the loud noise, but as time goes on, they accept them fully. Some of the more expensive dryers are quieter, but you'll find most dogs can get used to any of them. Just don't coddle too much; act like nothing is wrong and they get over it. I do allow them to cuddle into me as I dry them, but I don't allow myself to make comments like "Oh poooor baby..... so scared.. I'm sorrry.... it'll be over soon... ". They know your tone, and they seem to think there is then a reason to be afraid. This holds true with most things that might be scary, fireworks, storms, car washes, bigger dogs, etc. Be careful to watch the temperature. It should be warm, but never hot. You can turn off the heat for a bit if it gets too warm to the touch or your dog starts panting. Do be sure to choose a dryer with heat. If you use straight cold air, you will notice your dog doesn't like it much. They'll shiver. No one wants cold air blowing on them after a bath! Watch to be careful that you aren't allowing the hair to twist up as it dries, as that can create some awful snarls. I use the flat attachment, and just hold it so that I can see the hair going flat and not twisting or tornado-ing. Never blow into the eyes, nose or ears as serious damage can be done. I usually just get the neck good and dry, sneak a few stray shots underside of the beard to dry that, and then do a tiny bit on the top of their head while holding their ears closed against their head with my other hand so the wind noise doesn't bother them and it doesn't blow into their ears. It fluffs up the hair on their head and looks cute. Make sure you also remember to dry the underside of their paws thoroughly, any moisture left behind can turn the hair a dark reddish "stained" color. Choosing a high velocity dryer can be overwhelming, there are countless types and huge variances in price. 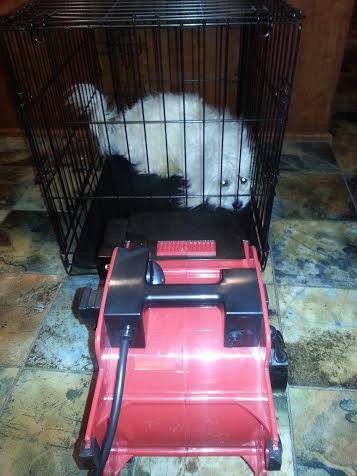 Crate dryers, that attach to their dog crate or sit outside it, aimed at them, seem like an easy, good idea. But they're not nearly as effective at fluffing up the hair on your Coton to achieve results similar to the groomers. It's a personal choice, as to what you like. If you're just looking for a small, effective dryer for home use, I have found the one to the left of this paragraph to be a great choice.